This is an extraordinary descriptive essay written by Nur Adlina. Nur Adlina is a Secondary 3 Express student who we taught our descriptive writing technique only this year. Prior to this, we taught her how to writing the first two paragraphs in the Bahagian Pengenalan when she was in Secondary 2 to expose her to some elements in our descriptive writing technique. So, this essay is her first attempt at writing a descriptive essay after learning the technique. And all praise to God, what a great essay she wrote! So how do we teach our descriptive writing technique? Firstly, our Secondary 3 students were taught some elements of our technique when they were in Secondary 2. However, their competent level is still at intermediate level as they were not taught the whole technique, and as such, could not see and appreciate how the elements taught connect and support other elements in the technique to form a complete descriptive essay. We did this on purpose as we felt that the students were not ready to learn our descriptive writing technique at Secondary 2. However, exposure to certain elements of the technique in Secondary 2 put them in a stronger position to learn the technique in Secondary 3. 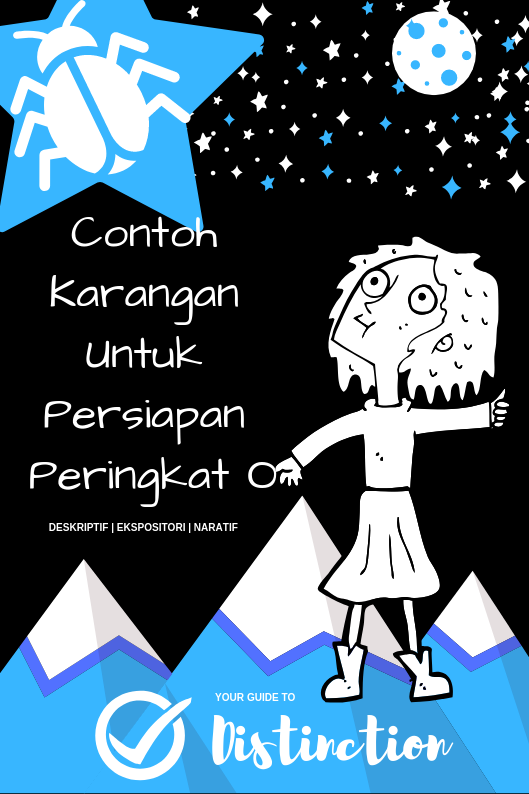 Secondly, every Secondary 3 students were given a copy of our book Contoh Karangan Untuk Persiapan Peringkat O. The book becomes a required text and a central piece in our teaching of the technique. We adopted a back and forth approach between (a) explicitly focused on illustrating the different elements in the technique as well as (b) monitor and provide feedback of student’s demonstration of learning. This we carried out over three cycles. We chose a descriptive essay from our book and familiarized our students the descriptive essay structure found on page 8 in the book by highlighting the specifics found in every paragraphs on the descriptive essay. We explained the ‘why and how’s the specifics play an important role in each paragraph and across all paragraphs to form a complete and a coherent descriptive essay. Next, we engaged students to highlight these specifics in another descriptive essay we chose from our book. They would then take turn to explain the ‘why and how’s the specifics work together to present a descriptive essay that meets the expectation of the question. As students presented their explanations, we queried students with probing questions to seek gaps in understanding and addressed them. We chose a descriptive question and engage students to demonstrate their learning by writing an descriptive essay. 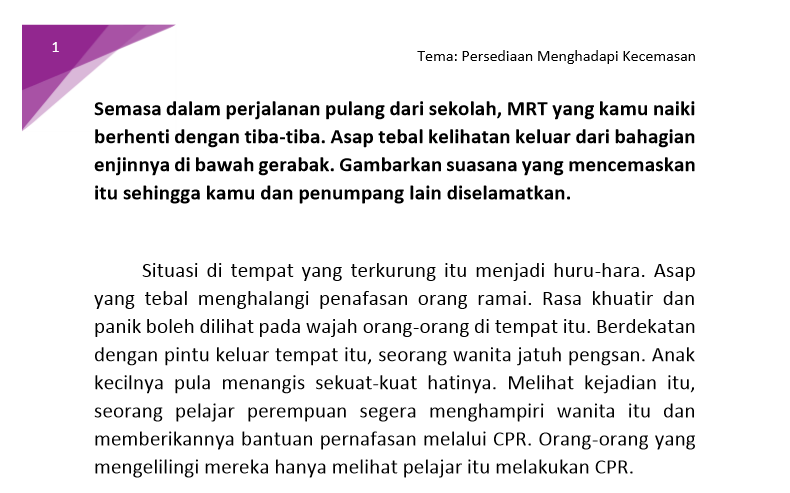 We chose a descriptive question from the November 2018 O Level Paper 1 for Malay language. Kamu menyangka bahawa ibu bapa kamu akan memarahi kamu disebabkan oleh sesuatu perkara yang telah kamu lakukan. Namun, setelah memberitahu ibu bapa kamu kedudukan perkara yang sebenarnya, mereka tidak memarahi kamu. Gambarkan kejadian itu dan pengalaman yang kamu perolehi daripada kejadian tersebut. We used flipped classroom pedagogy for this activity. In this activity, students submitted paragraph by paragraph of their 5-paragraph essays every lesson in a specially created Padlet website. In the Padlet website we embedded short video guides that illustrated students how to write each paragraph correctly. The video guides reinforced what students have already learnt in the first cycle activity. Teachers may ask how can they access these video guides. Well, the video guides are available in the password-protected spaces in this website. We provide teachers who have attended our workshops before with the passwords to access these spaces. Now, we provide these passwords also to teachers who use our books to help them teach our writing techniques to their students better. We selected and read a few students’ paragraphs in each lesson for feedback. In our feedback, we highlighted common mistakes that students generally made so that our comments were applicable and useful to all students, even those whom we did not read their paragraphs for feedback. We carry out the the third cycle when we feel the need to remediate if learning gaps continue to exist and are evident from student’s paragraphs. When this happens we will select the specific paragraph(s) and demonstrate how we would write it ourselves onto the whiteboard for all to see. We will talk aloud or verbalize loudly every decision we took when writing every single line. In this way students will understand the rational behind every moves we took when writing the paragraph(s). The pedagogy for this approach is called Cognitive Apprenticeship. Cognitive Apprenticeship is a theory that attempts to bring tacit processes out in the open. It assumes that people learn from one another, through observation, imitation and modeling. In our case we use modeling and talk our thought process aloud to demonstrate to students the tacit process when writing every paragraph of a descriptive essay. We have received a query from a teacher asking if we will be organizing any workshop for teachers in the future. We have a workshop coming up in May but it is for trainee teachers. However, with the coming March holidays, we welcome any school who would like to invite us to hold a workshop for teachers who are using our writing techniques when teaching descriptive, expository and/or narrative writing. We propose a Q&A format workshop where participants come with a list if questions seeking clarification about our writing techniques and how to teach them better. If you are keen to hold the workshop in your school this March holidays, let us know and we will help promote the workshop via our website. We suggest the workshop should be open to teachers who are already using our writing techniques so that they have some prior knowledge before attending the workshop. In this way, they will enjoy tremendous benefits from the workshop, if God wills. To answer an imbuhan question students have to cross two bridges. The first bridge is to identify which part of speech (for example, verb, noun or adjective), the answer to the imbuhan question belongs. The second bridge is to select the right imbuhan from a list that belongs to that part of speech. Our scientific approach to learning imbuhan helps students to cross the first bridge. Having successfully cross the first bridge, student will then choose imbuhan from the correct list as they have chosen the right part of speech as the answer to the imbuhan question. Make sense? : ) Check out the video to find out why. This is the twin book to our earlier book, and this is a must-have book for teachers and students preparing for the O level exams. A real gem! If you like to own a copy, please sms 81213129.